Botton Village, a “community with adults, some of whom have special needs”, is in the heart of the Esk Valley - geographically and since this Public Meeting also emotionally. 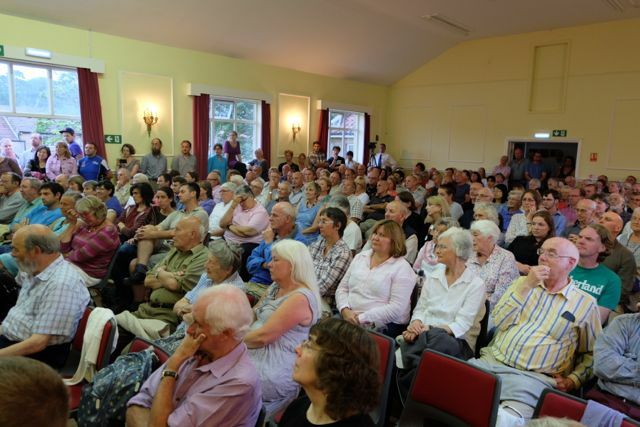 There are not many issues that bring together 250 local residents but on the evening of 24 July they crammed into Danby Village Hall to hear about the changes that are taking place down the road in Botton. The meeting heard genuine and moving statements from villagers living in Botton, who were able to convey their love for their way of life and work with the Co-workers. With first hand experience as a former Co-worker, Catherine van Dam gave a lively description of life in the Camphill community of Botton, eloquently and with a good dose of humour: Botton as a social endeavour, where disability ceases to matter, always meant as a community of people and a form of living together. She also explained that employees have always been needed and welcomed in Botton but that the services they provide are not the same as the shared living we are trying to protect. 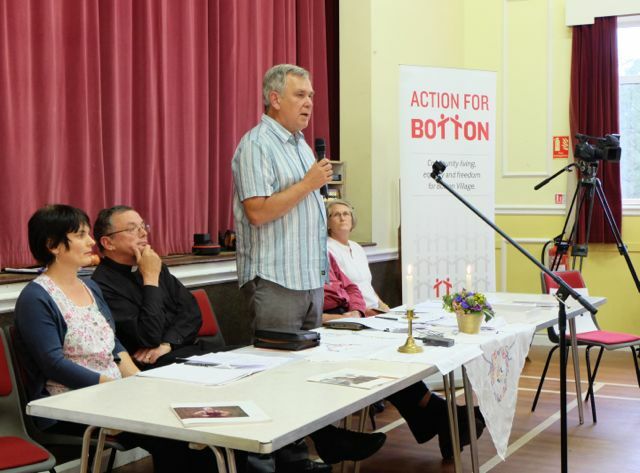 James Fearnley, whose connection with Botton and Anthroposophy goes back decades, told the audience how the Charity whose job it was to support this inclusive way of life is turning it into a top-down managed institution staffed by shift care workers. As a mother of a learning disabled young adult, Jackie Riis-Johannessen was able to give us an insight into the benefits that come with the ongoing relationship and deeper connection the villagers can form with the people they live with in Botton. Charity officials were invited well in time so they could explain their reasons, and they declined. Their absence was symbolised by an empty chair labelled “CVT” – about the only empty chair as the hall was so full. The meeting heard that CVT had resolutely rejected all requests to reveal the facts they claim force their actions, and also refused to enter into any discussions to try and resolve the issues (just as they had refused to come to the meeting). The Esk Valley residents were united in their opposition to these changes and the way they are being forced through, without consulting any of those living at Botton, and were shocked to hear how those who had given decades of service as volunteers were now presented with an ultimatum to either abandon shared living and become employed (if CVT felt their work structure needed them) or leave their community and homes. The resolution was passed unanimously with not a single vote against. The audience also heard of the dilemma that most Co-workers are facing now: they feel they can not collaborate with the destructive ways and actions of CVT and thereby also betray the trust and expressed wishes of the villagers, even though they risk suspension by speaking up for their values and rights. After much soul-searching Co-workers arrived at a declaration, which is since being referred to as the Botton Declaration, to state with confidence what they stand for, their Camphill values in this challenging time. The Co-workers stood up as it was read to a captured audience, and were then joined by all present with a long and enthusiastic standing ovation. It was clear to us all that we witnessed a historic moment for Botton and Camphill. 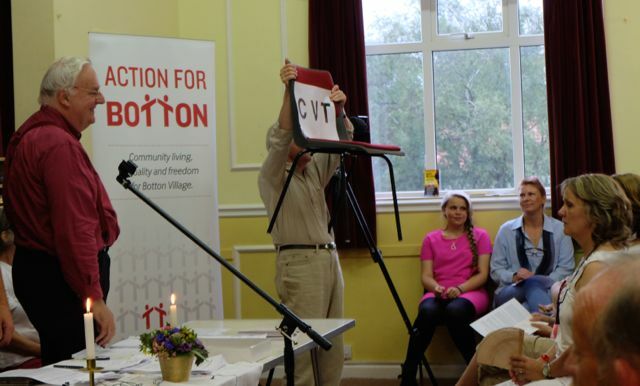 After the meeting, Chairman Neil Davidson wrote back to the CVT in light of their non-attendance and ongoing non-engagement, read his letter to CVT.